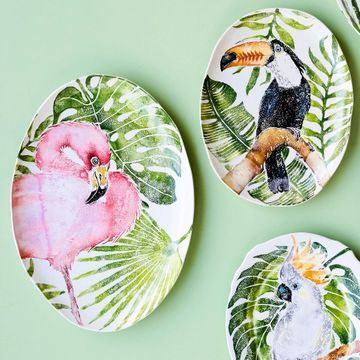 The new Into the Jungle collection from VIETRI features four jungle animals and four jungle birds including: lions, tigers, cheetahs, zebras, toucans, flamingos, cockatoos and parrots. The core dinnerware pieces feature assorted complimentary palm leaf designs including banana leaves, palm leaves, arica palm leaves, and monstera leaves. The collection includes dinner plates, salad plates, cereal bowls and mugs with select serving bowls, platters and trays. This colorful collection would pair nicely with solid color dinnerware and would also make quite a statement as a wall hanging grouping or shelf decor when not in use on the tabletop. Made in Italy.